Meat diet experience: one of the frequent and fairly common misconception with weight loss is that the meat cannot help you in losing your weight. On the contrary, the results are obvious and we are going to support it, despite all the challenges of the people. Carbohydrates are minimized and almost completely expelled from the menu. This is quite a restrictive measure if we know that in the modern way of life the human body relies on glucose from carbohydrates that would satisfy the daily needs with the energy. When you reduce their intake, the body is forced to spend almost all reserves in the liver (glycogen) and switches to ketosis state. Ketosis is therefore a condition in which the number of ketone bodies (ketones) in the blood increases, immediately following the exhaustion of glycogen from the liver. Then our body relies on fat burning to extinguish energy. The man in his distant past was leaning against the meat of hunted animals, and was constantly in a state of ketosis. Meat diet does just that: that we are genetically predisposed to like this diet. Such rigid attitude leads to differences of opinion with dieticians and nutritionists around the world, as veganism become a trend, it is not easy to accept it. We will not deal with such analyzes, whether it is correct or not. We will like with the other diets for weight loss write on our blog, and give a detailed plan so it is up to you to decide whether you like this diet or not. For this we note that you have to have a necessary consultation with your doctor before beginning a diet! If you do not have a problem with the sentence that we are genetically predisposed to this type of diet, let’s start. Meat diet strictly adheres that ketosis cannot be interrupted by entering nutrients. Eggs and meat do not contain carbohydrates and they represent basic food, extremely rich in protein. This diet does not support the entry of bread, and at the beginning you can eat a little sour cream or cheese, hard cheese, until your body does not adapt to the new menu and diet. Ketosis does not begin immediately after the start of the local diet but it takes several days for the body to start it. Meat diet is effective in reducing appetite which is an important factor for weight loss. Namely high intake of protein in the blood, without the input of nutrients which are converted into glucose, stimulate the whole body and reduce appetite. Since there is no quantitative restrictions on the entry of meat and eggs, during the diet you will not be hungry. 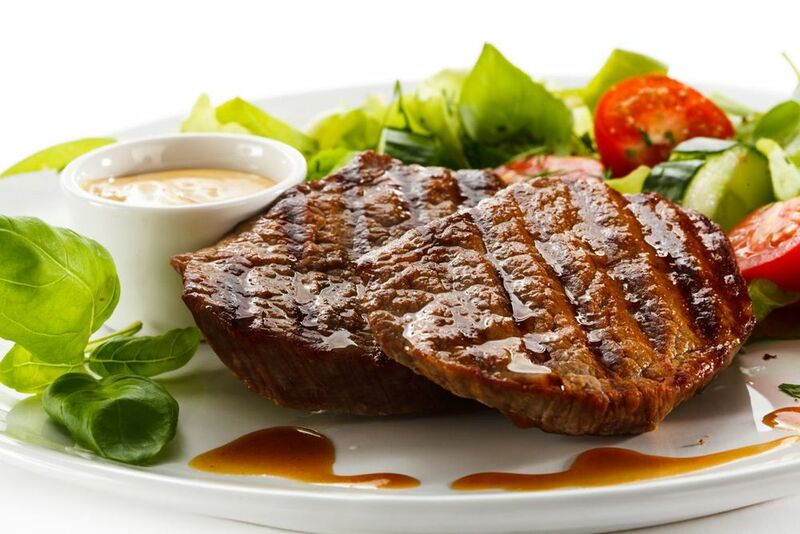 Meat diet has a great advantage over other methods of weight loss, because there is no restricted calorie intake. We will start from drinks, the lowest daily intake is 2.5 liters of water. Avoid carbonated beverages, only water is good. You can drink coffee only without sugar. Consume all the meat: beef, pork, fish, goat, veal, chicken, turkey, duck, red meat and other. Make an effort that the food is always fresh, and in the preparation of use grill, roast in oven. Avoid fried food. "Meat products" such as hot dogs, bologna, salami, and pate avoid in the widest possible way because they do not have a lot to do with meat and are full of carbohydrates and chemicals. Cans are also unreliable because of preservatives. Try not to enter a lot of fat, because meat diet burns your own stocks of fat, you do not need a new ones and the purpose is to melt your body fat. Like many diet, meat diet has several variants. First one is fierce protein variant - restrictive and only eggs and meat are allowed, it gives the best results but is also the most dangerous one. We will give you an example menu for something milder form, also one of the versions and also one of the variants is the Atkins diet that we discussed earlier on the blog. According to the above-written menu, meat diet is one of the more expensive diets. One should not ignore the economic factors when choosing diets. All food is easily available but the price is not so friendly. Beef steak, for example is very expensive. On the other hand if you are planning to invest in yourself and your health, you have nothing to sway, meat diet is a great choice. You have to at least partially compensate for the lack of vitamins and minerals in the form of tablets. Meat diet should not be kept longer than 14 days and during that time you can lose up to 10 kg. Although there are guidelines and menu, participants who ate only eggs and meat have achieved much better results, but in this way mead diet is even more dangerous to your health. Be sure to read the following articles: Mayo diet, Dukan diet, the Scarsdale Diet, South Beach Diet.